The highly anticipated Women’s 4-Wall Final pitted the top two women in the sport playing for the title only the two of them have held since 2012. Reilly captured the Simple Green U.S. Open last year, ending Casey’s two-year reign as champion in a scintillating 11-9 come from behind tiebreaker victory. 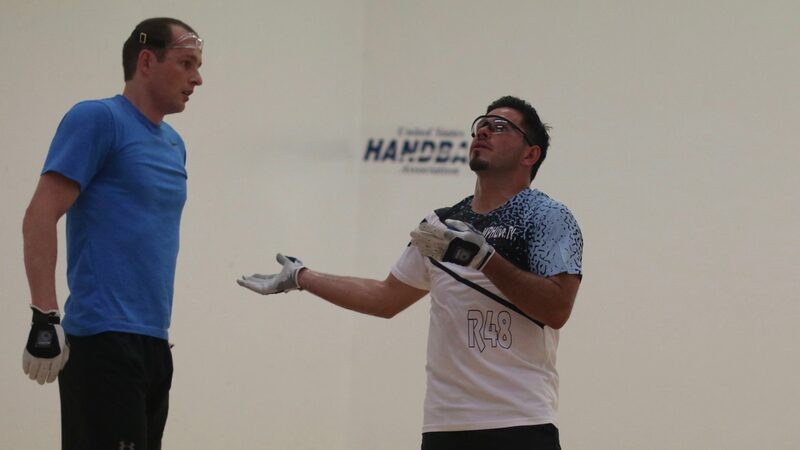 Casey eliminated any drama from this year’s final by teaching a handball clinic in the two-game final and never allowing Reilly into the match. Casey took game one 21-3 in just 12 minutes and was only challenged when tied at 12 in game two. Casey scored nine of the final 11 points of the match to reclaim her U.S. Open title in emphatic fashion. Mando Ortiz and Killian Carroll met for the fifth time in 12 months in the bottom bracket semifinal, with the pair splitting their first four encounters. 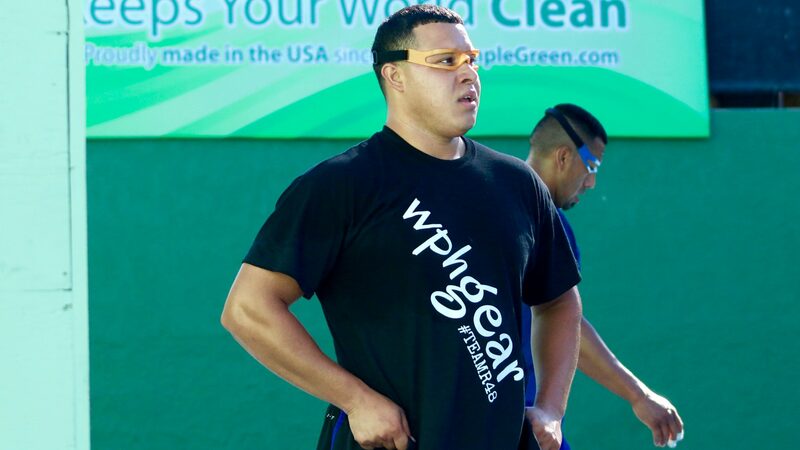 Ortiz and Carroll electrified the pro-Ortiz gallery in game one, exchanging bottom board rollouts and diving retrieves. Ortiz trailed for much of the game but rallied late, coming back from 17-19 and scoring the final four points of the game to take a one-game lead. “It just seemed like Mando was killing everything from everywhere in that first game,” stated R48 pro and Ortiz confidant Shorty Ruiz. Ortiz was flat in game two, offering little resistance to Carroll and dropping the game in just 16 minutes. The pair entered the tiebreaker for the third time in their five matchups. Carroll had won their previous two tiebreakers and seemed to be in a good position to win his third tiebreaker in the rivalry to advance to his first U.S. Open final, as Carroll built a 7-5 lead. Ortiz responded by scoring five consecutive points, three coming off uncharacteristic hand errors from Carroll. Carroll earned a side out at 10-7 and quickly scored his eighth point with an ace down the right. Encouraged by his home crowd, Ortiz won an eight-shot rally to regain the serve and ended the match with a left hand kill. 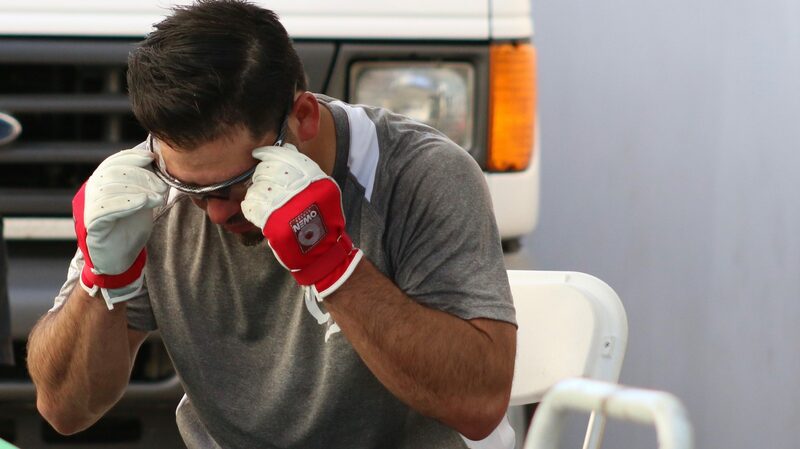 “I’m happy with the win but I need to be sharper tomorrow,” revealed Ortiz during his post match massage. SR48 #1 and defending Simple Green U.S. Open Master’s champion Marcos Chavez was aiming to defend his U.S. Open Masters title in the tournament he has owned since 2006. Chavez would need to defeat Southern California’s Chris Watkins in the upper bracket semifinal to have a chance at the coveted repeat. Chavez and the “Waddy Dog” played virtually even in the first two games, setting up a tiebreaker. Chavez flipped the switch in the third game, shutting down Watkins to advance to the final. Naty Alvarado Jr. has little difficulty advancing in the bottom bracket, defeating Dan Armijo to setup a rematch of last year’s Masters final. 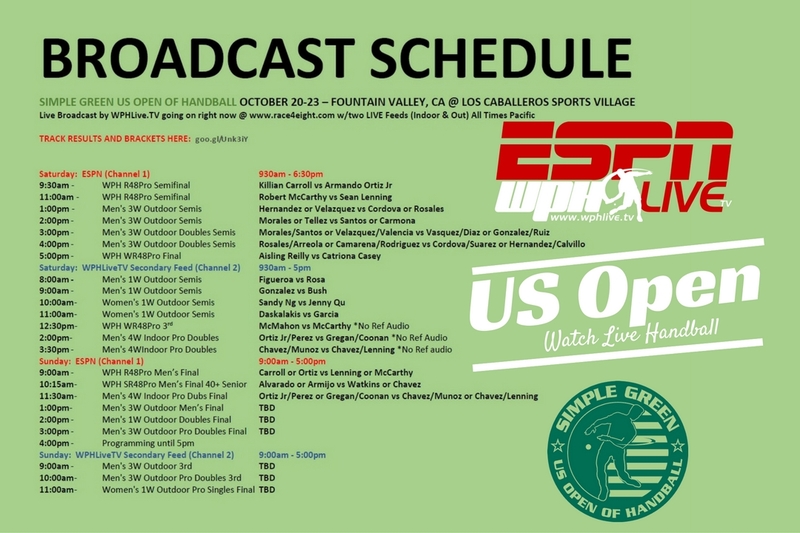 Traditionally the most competitive and exciting bracket at the Simple Green U.S. Open, the 4-Wall pro doubles was anything but on Saturday, with the top two seeded teams blowing away their opponents in the most lopsided doubles semifinals in the history of the 4-Wall Doubles at the U.S. Open. Defending champions Mando Ortiz and Vic Perez took Ireland’s Michael Gregan and Ger Coonan to the woodshed, while Marcos Chavez and Sean Lenning emphatically ended the Cinderella run of Vince Munoz and Carlos Chavez. 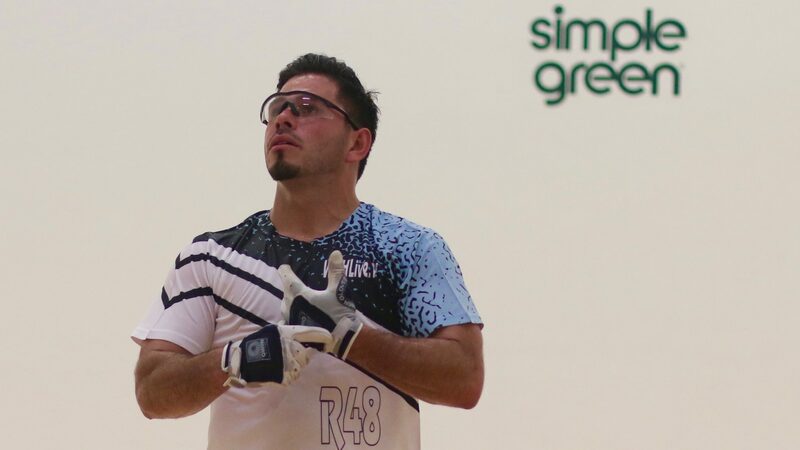 Samzon Hernandez continued his undefeated streak at the Simple Green U.S. Open 3-Wall singles, ousting an exhausted Boxer Rosales in two games to advance to his fourth final in four years at Los Caballeros. Fifth seeded Team Cordova/Suarez emerged from the upper bracket of the 3-Wall Doubles, easily defeating the top-seeded defending champions Boxer Rosales and Juan Arreola. Second-seeded Team Shorty Ruiz/Gonzalez faced third-seeded Juan Santos and Alfredo Morales in the bottom bracket semifinal in a match that produced endless drama and theatrics. Team Morales/Santos dominated game one and appeared to be closing in on a relatively easy two-game victory, but Team Ruiz/Gonzalez rallied, erasing a 10-3 deficit and forcing a tiebreaker. 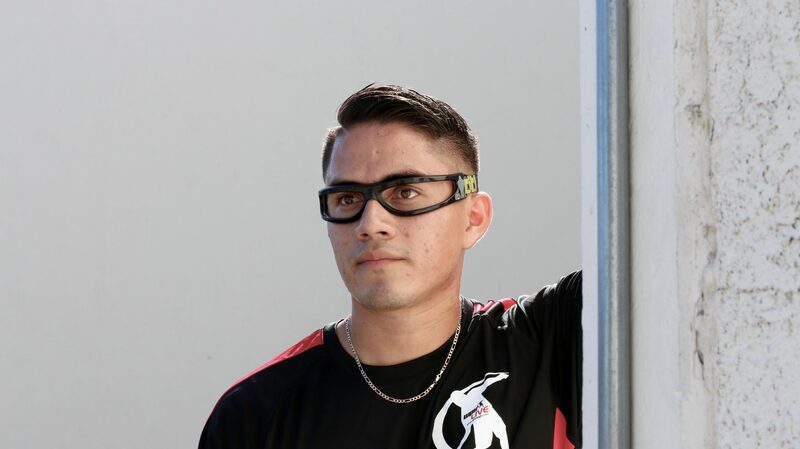 A collision between teammates Timbo Gonzalez and Shorty Ruiz midway through the tiebreaker left Gonzalez writhing in pain, as Gonzalez appeared to have reinjured his left knee he initially hurt in Las Vegas four weeks ago. Gonzalez created a makeshift knee brace by ripping a t-shirt and tying it around his knee, miraculously recovering from barely being able to walk to flying all over the court and tying the score at eight with the help of the makeshift brace. One of Gonzalez’s supporters provided Timbo with actual knee brace during a timeout at 8-all, forcing Gonzalez to retire the ripped t-shirt brace. Gonzalez was not the same player without the ripped t-shirt around his knee, as he and Ruiz dropped the serve and three straight points to bow out of the match. 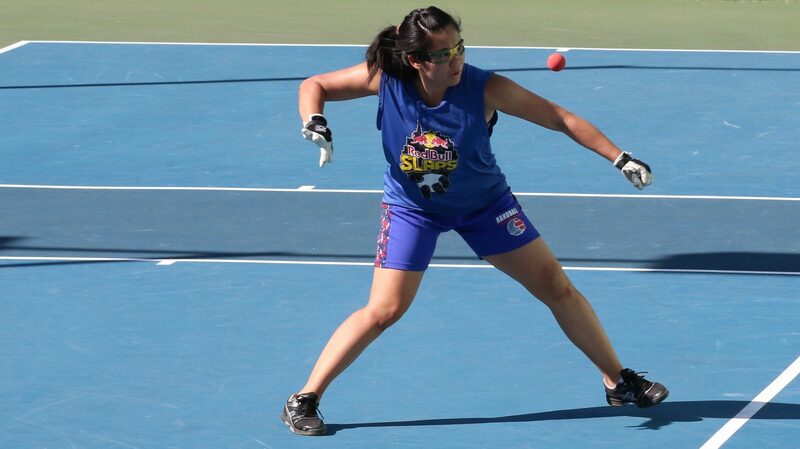 Women’s defending 1-Wall single champion avenged her loss from the 3WallBall Championships four weeks ago in the upper bracket semifinal, defeating Jenny Qu to advance to the final and ending Qu’s undefeated WPH Outdoor record. Ng and Qu battled for nearly 2.5 hours in one of the longest matches of the tournament. Ng closed out the match in style with two straight rollouts in the tiebreaker. 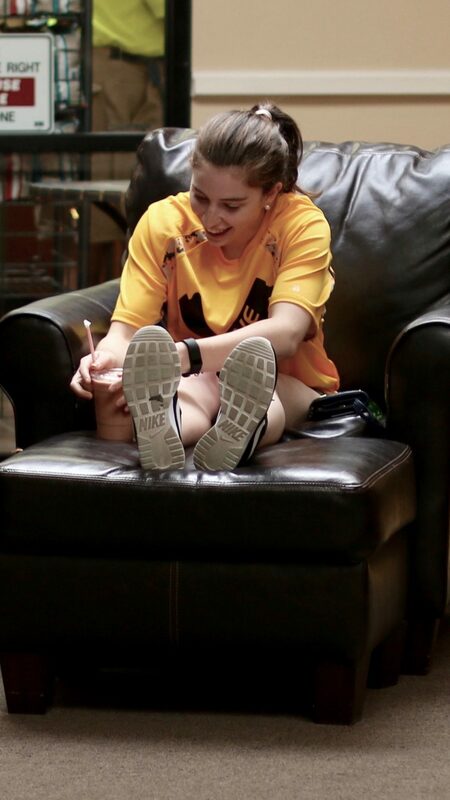 Danielle Daskalakis survived a close first game against Bee Bee Garcia and cruised in game two to setup a rematch of last year’s U.S. open 1-Wall final with Sandy Ng. 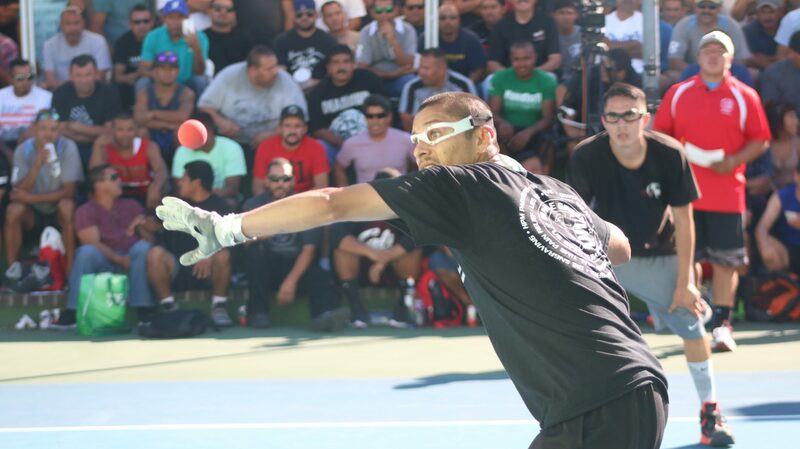 Two-time defending champion Timbo Gonzalez continued his outstanding 1-Wall play in the upper bracket semifinal, defeating Kadeem Bush with shocking ease for the second time in four weeks. 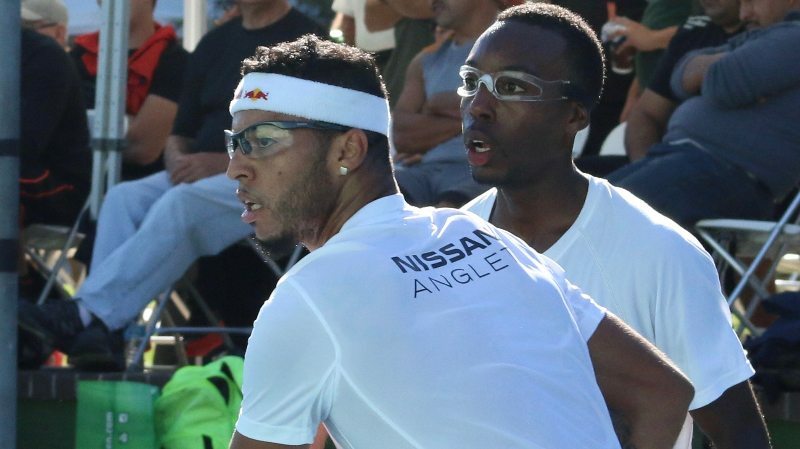 Gonzalez will face former doubles partner and current national 1-Wall singles champion Tywan Cook in Sunday’s final. Cook cruised past Carlin Rosa in the bottom bracket semifinal. Fountain Valley, CA, WPH Press, 10/21/16- Friday featured Race 4 Eight round of eight action and WPH Outdoor round of 16 action. Killian Carroll started quickly against Emmett Peixoto, dominating game one with effective aggression and power serves. Peixoto was a different player in game two, slowing down the action and making the retrieves for which he is known. “I just felt old and creeky in the first game,” stated Peixoto. “These early morning matches are hard for me.” Peixoto built an 11-5 lead in game two, only to be caught by the current national champion at 11. The doubles partners traded the lead five times in the game’s second half, exchanging incredible kill shots and diving gets. Carroll eventually led 20-18 and closed out the match with his sixth diving re kill of the match. 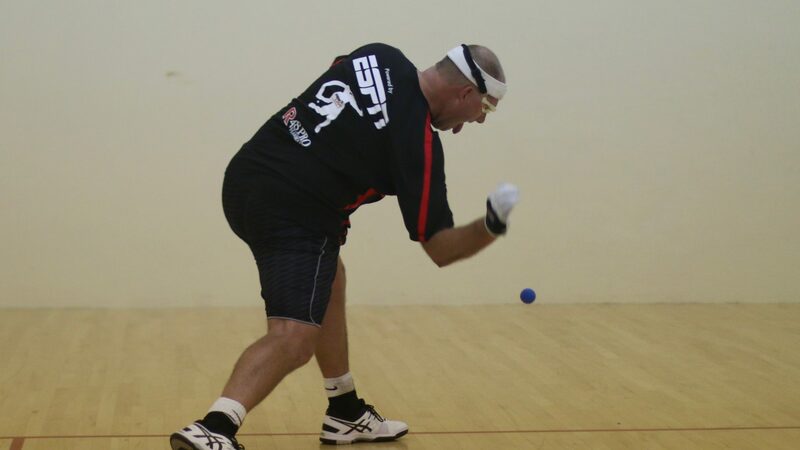 Sean Lenning played outrageous handball in building a 20-7 first game lead, killing the ball from nearly everywhere on the court with both hands. Cordova extended Lenning late in game one, forcing nine side outs and scoring three points to build momentum going into game two. Cordova found his groove in game two, building a 20-10 lead and closing out the game 21-14. 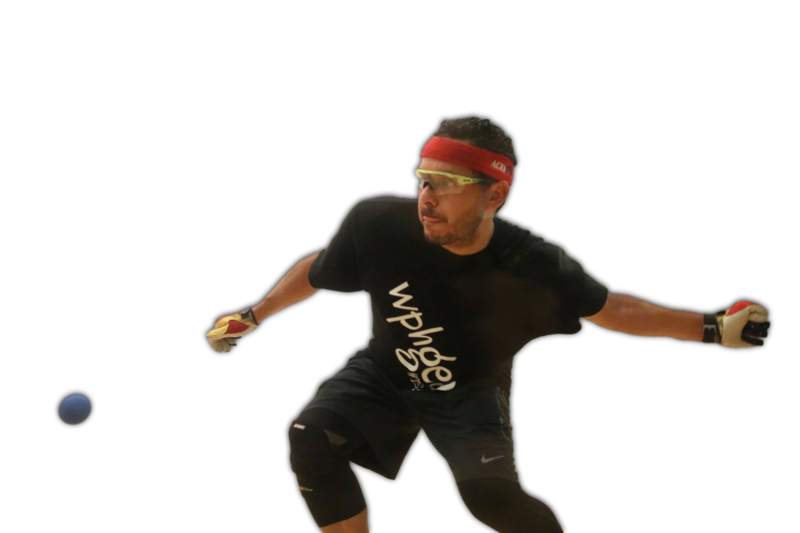 Cordova grabbed a 4-0 lead in the tiebreaker and appeared to have the upset within his grasp until Lenning reeled off six aces in seven swing to take a 7-4 lead and cruise to an 11-5 victory. Saturday’s WR48 singles was dominated by the Irish, with each of the four semifinalists hailing from Ireland. 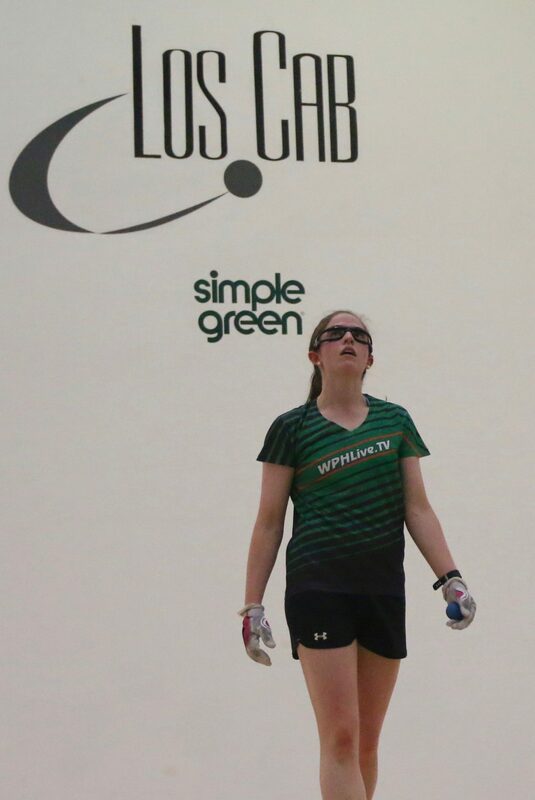 Defending champion Aisling Reilly outscored her opponents by a combined 84-4 in her two matches on Saturday, showing no mercy on her two Irish opponents. Catriona Casey and Martina McMahon advanced to the semifinals in the bottom bracket, setting the stage for a primetime classic on Los Caballeros’ show court. The two ladies thrilled the packed late night gallery with sensational shot making, power, finesse, speed, and ball control. McMahon started strong in game one, leading 7-5 with effective power serves and deep court kills. Casey remained calm, digging many of McMahon’s best shots and patiently waiting for her opportunities to end rallies. Casey was nearly flawless in converting her offensive opportunities, making just four errors against 27 kills for the match. The ordinarily stoic Casey even cracked a smile after connecting on a flat rollout with her left hand midway through game one. Casey gained control of the match late in the first game and never looked back, advancing to her third consecutive U.S. Open final. 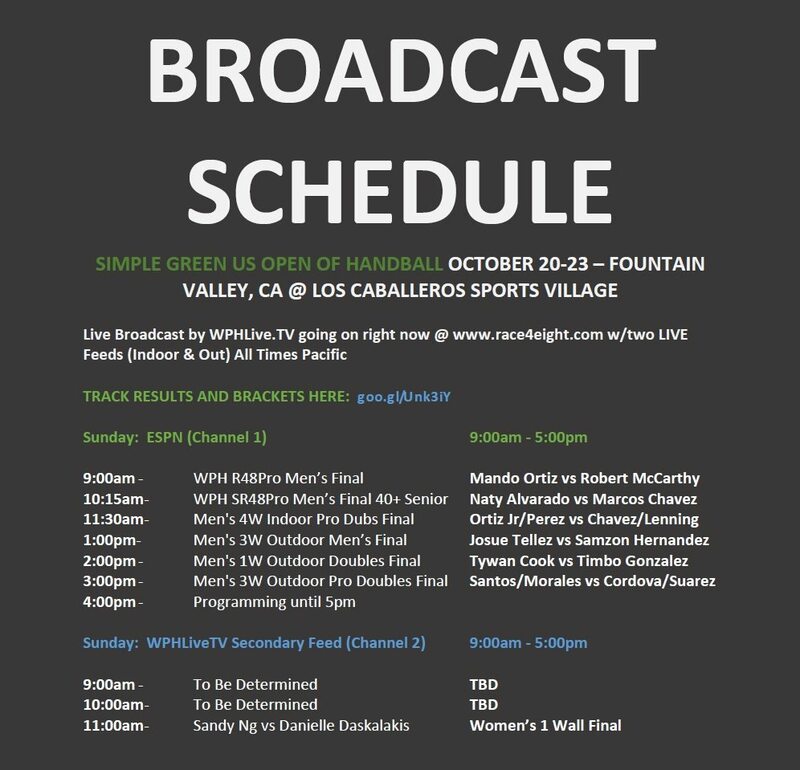 Fountain Valley, CA, WPH Press, 10/20/16- Thursday kicked off the “Festival of Handball” at Los Caballeros Sports Village in sunny Fountain Valley, CA. The Race 4 Eight R48pro, WR48pro, and SR48 pro brackets kicked off the sixth season of Race 4 Eight play, while the WPH Outdoor stars concluded their season on the 3-Wall and 1-Wall courts. The top men’s players on the Race 4 Eight tour played two matches on Thursday, with the R48 pros playing their round of 32 matches in the morning and round of 16 matches in the afternoon. The Race 4 Eight season kicked off with several thrilling tiebreakers in the Simple Green U.S. Open’s round of 32. Luis Cordova narrowly survived white-hot Cody Townsend, receiving serve just two points from an early round exit in the tiebreak. Cordova ended the match with three straight kills to deny Townsend, 21-15, 16-21, 11-9. Oregon’s Dalton Beall advanced to his second consecutive R48 round of 16, dispatching Abraham Montijo in an 11-6 tiebreaker after dropping game one. 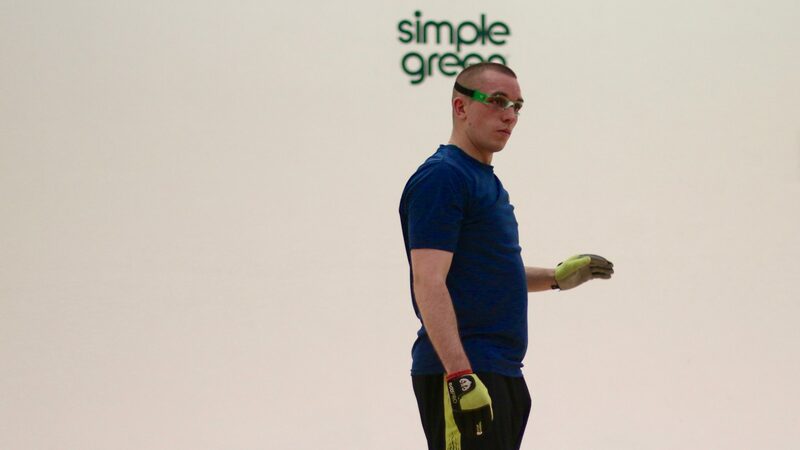 Ireland’s Peter Funchion advanced in the opening round by the slimmest of margins, ousting WPH cross over star Shorty Ruiz in the day’s closest tiebreaker, 17-21, 21-4, 11-10. NorCal’s Erik Torres found himself just four points from a first round exit against Canada’s “Bowl Dog” Ryan Bowler, losing game one and tied 17-all in game two before pulling away to win an 11-6 tiebreaker. After the round of 32 dust settled, just one of the top 14 seeds was eliminated, with each of the top eight seeds cruising in two games. Each of the of eight seeds advanced in the round of 16, with several needing big comebacks to advance to Friday’s quarterfinals. Top-seeded Sean Lenning, second-seeded Mando Ortiz, and third-seeded Killian Carroll cruised in two games. 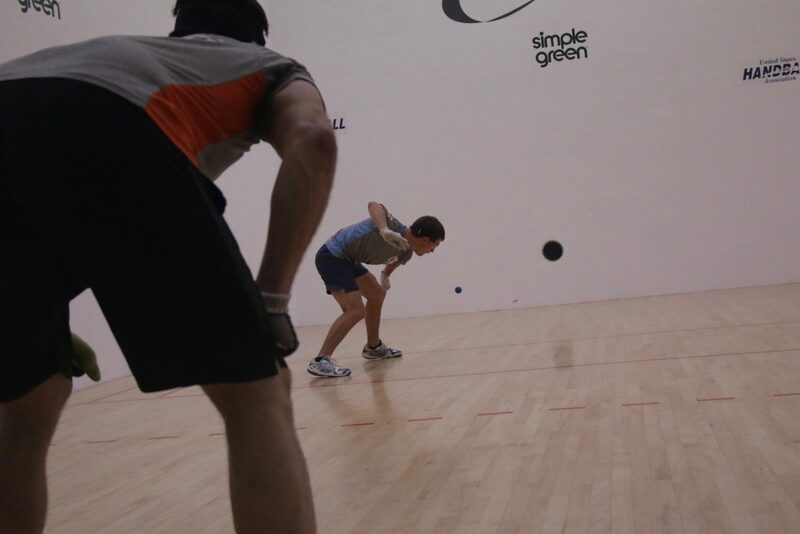 Fourth-seeded Luis Moreno trailed 14-10 against Stephen Cooney in game one before rallying to win 21-14, 21-5. 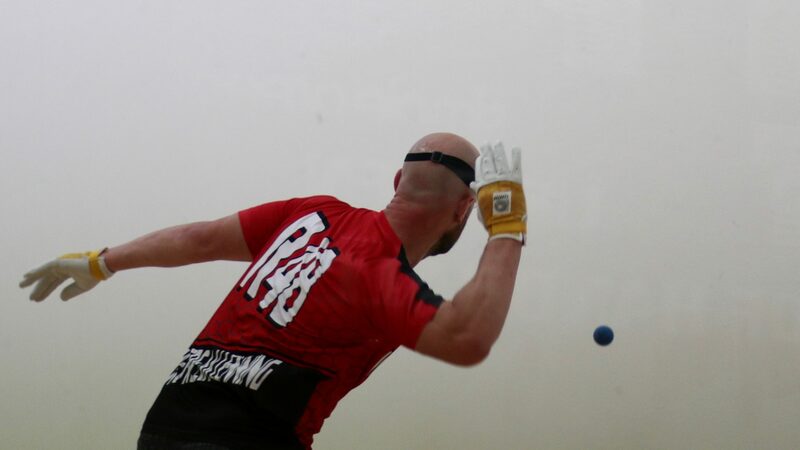 Fifth-seeded Robbie McCarthy trailed Southern California’s Vic Perez 17-5 in game one before a furious rally saw “The Buzzsaw” tie the score at 19 and close out the first game 21-19. McCarthy would dominate game two to advance. Sixth-seeded Emmett Peixoto needed a tiebreaker to eliminate longtime rival Jonathan Iglesias, surviving a nearly two-hour marathon to live to play on Friday. Seventh-seeded Charly Shanks had no problems with an ailing Luis Cordova, and eight-seeded Daniel Cordova played exceptionally well in taking down David Fink in two games. 10 women kicked off their WR48 season on Thursday, with each playing for a spot in Friday’s quarterfinal round. Just as in the R48, the top eight WR48 seeds are set to meet in Friday’s quarterfinals after four lopsided matches in the round of 16 and one tiebreaker. The day’s best match featured Missouri’s Samantha Koehler against Ireland’s Sinead Hanley. After splitting two close games, Koehler came up with the good in the tiebreaker, advancing to face Catriona Casey on Friday. 90-degree temperatures challenged the top outdoor players in the game on Thursday. 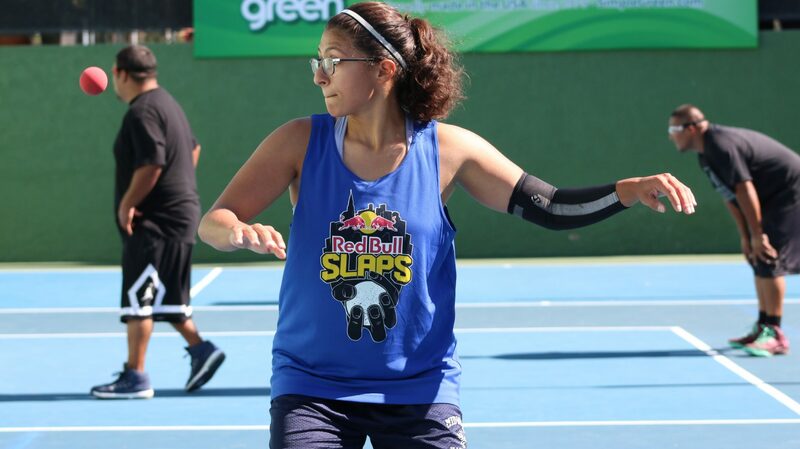 Temperatures are expected to be even hotter on Friday, as the Men’s 3-Wall and 1-Wall Singles and Doubles will play round of 16 matches, as well as Women’s 1-Wall round of 8 singles and doubles.